Greg Mandt is responsible for the success of the GOES-R space and ground developments, launch and on-orbit checkout. This $7.6 billion effort is currently in the early development stage with a projected first satellite launch date in 2015. This is a big deal... perhaps one of the most important questions customers pose to their satellite providers surrounds whether or not your infrastructure investment is sufficient enough to handle rapid and exponential growth in big data requirements. Both the commercial satellite manufacturing and launch services industries now face a low(er) demand period with increasing supply. June was a busy month for Rupert Murdoch. Prior to announcing his divorce from Wendi Deng on June 13th, on June 11th News Corp’s shareholders approved the company’s plan to divide itself into two entitites, effective as of June 28th. Any satellite communication system is required to balance bandwidth and power distribution over the coverage defined by its target market. 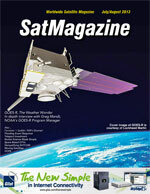 This article will introduce readers to a proposed new concept for delivering payloads/satellites to geosynchronous orbit (GSO) that weigh twice as much—and cost half as much—to launch than with expendable launch vehicles, and to service and refuel satellites on- orbit, and to conduct other missions not currently possible. Utilities are making significant progress in developing next-generation communication networks capable of supporting the smart grid and other critical applications. With respect to Economics 101, the well-known Law of Supply and Demand usually applies when discussing the acquisition of critical talent. Often the job of a satellite is to sit above the Earth in a stationary orbit and supply TV, video and data across a wide area from a single location in the sky. It’s a well-known mantra of strategic planners, “hope is not a strategy.” I think anyone responsible for making a payroll, keeping the factory doors open, or accountable for achieving a mission, knows this.